Robert Windle in action. Photo: Mark Sweet. The chairman of the Peterborough Referees Association admits he’s ‘disturbed’ by recent incidents of abuse aimed at teenage officials. 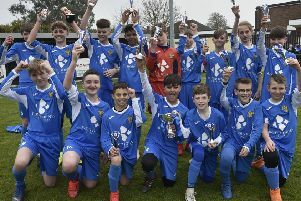 On successive weekends an under 11 cup semi-final was marred by a 16-year-old referee suffering abuse at the hands of coaches and a 17 year-old referee then abandoned a Peterborough League men’s match after becoming fed up with the amount stick she received from the players. Robert Windle (right) with Prince William. Robert Windle is the leading trainer and mentor of young referees in the area as well as chairman of the Peterborough RA. He’s now concerned recruitment of young referees could become more difficult. Windle has also made some suggestions to improve the situation. Windle said: “Recent events have been deeply disturbing. As an Association that supports referees and helps with their development and reaches out to schools and clubs we have noted the support flood in for these two young people. “It is regretful an excellent season has been tarnished by an idiot mentality of a very small minority group. “I appreciate that without passion and emotion, football would not be the great game that it is, however some have not realised when they are crossing the line and others also have a responsibility to stop them crossing that line . “The Peterborough Referees’ Association is proud we host many courses for new referees and we are concerned that the hard work we have done to recruit, train and mentor could be hit. “We appreciate that many of our young referees perhaps lack life skills and we try to develop this to assist their game and benefit the football match day experience. *All referees to take an online ‘Laws of the Game’ updates test, to attend one development session and to be mentored once every three years. *For teams to provide suitable fit and proper changing areas for referees and teams. *For the Leagues/ County FAs/ RAs to create a series of roadshows which club managers must attend and will include an understanding of the match day for a young or inexperienced referee. *For each player/manager at grass roots level to have a discount card for sponsors’ products, but which may be withdrawn temporarily or permanently if a serious offence is committed. *The referee to be paid promptly within 10 minutes of a game finishing. Or prior to the game. *For club assistants to have the opportunity to attend an evening specifically designed for their roles. *Teams who continually cause issues to have points deducted and if an agreed limit is reached to be removed from the league. *For matches from under 7-12s to have silent touchlines apart from applause.